An interconnected pair of adjacent 1-bedroom villas, each with a private pool, twin sun-loungers, poolside shower and balé, open-air dining area, living room, guest loo, air-conditioned king-sized bedroom and indoor-outdoor bathroom, plus a spa bath in Villa 10. A discrete doorway between in gardens connects these two villas to give a unique 2-bedroom property, ideal for a small group or family wanting extra space and privacy. Villa 9 is a Balinese style one-bedroom villa with a stunning sun-drenched pool, a traditional, thatched balé, a wooden deck and a beautiful walled, landscaped garden, perfect for enjoying magical sunsets or romantic, candlelit, al fresco dinners. An open-plan, indoor-outdoor living area with high ceilings and sliding glass doors allows a gentle tropical breeze to circulate through the villa, or can be closed and fully air-conditioned. A magnificent, carved, antique Javanese door, set in a stunning intricately designed frame leads from to a perfectly proportioned double bedroom with king-size bed. The bathroom on Villa 9 is a blend of nature and luxury with a large terrazzo bathtub, surrounded by a fishponds and magical jungle gardens, where ornate, antique statues peek out from behind leafy trees. Villa 10 is entered via large stone steps, leading to a charming villa with an expansive teak wooden deck and a turquoise-tiled swimming pool, shaded by lush palms and winged fern tree. An indoor-outdoor lounge and bedroom suite, recently redecorated with contemporary interiors, can be fully closed for blissful air-conditioning, while romantic canopied mosquito netting can enclose the super king-sized bed to create an intimate hideaway. A discreet stone path leads from the lush garden round to ornamental fish ponds, stunning rockery and a cascading waterfall that offer the backdrop to a heavenly bathroom. A terrazzo bathtub surrounded by fish ponds and waterfalls offers a romantic and relaxing bathing experience, while twin basins, large teak cupboards and a massage bed make this a spectacular bathroom, with a second guest loo next to the sun deck, where the swimming pool is fringed by a charming thatched balé and a four-seat antique wooden table, perfect for al fresco dining. We look forward to coming back to Villa Kubu. We had a lovely time in Villa Kubu. Thank you all so much for welcoming us and providing amazing service. We look forward to coming back to Villa Kubu. Villa 9 was wonderful we will see you again !!! Thank you so much love from Anne & John, Villa 9 was wonderful we will see you again !!! Many thanks from Villa Kubu! 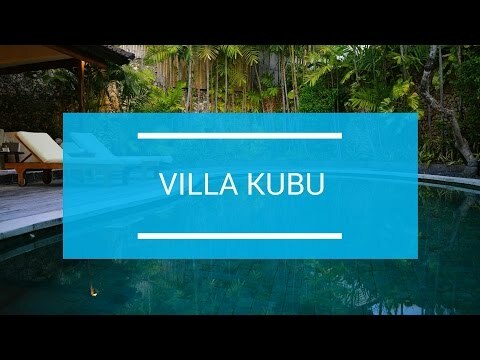 We loved everything about Villa Kubu.